Tonga is located in the Pacific Ocean south of Samoa. Also known as the Friendly Islands, it comprises 176 islands, 36 of which are are inhabited. Tonga is the only monarchy in the Pacific since Taufa'ahau (King George) in 1875 declared Tonga a constitutional monarchy. He also gave Tonga its first constitution. Tonga is one of the few countries that have successfully resisted European colonization, and it has never lost its sovereignty to a foreign power. Tonga became a protected state under a Treaty of Friendship with Britain in 1900, Although under the protection of Britain, Tonga maintained its sovereignty, and remained the only Pacific nation never to have given up its monarchical government (as did Tahiti and Hawaiʻi). The Tongan monarchy follows an uninterrupted succession of hereditary rulers from one family. In 1970, Tonga acquired its independence. The Treaty of Friendship and Tonga's protection status ended that year under arrangements established by Queen Salote Tupou III. Tonga joined the Commonwealth of Nations in 1970 and became a member of the United Nations September 1999. Almost two-thirds of Tonga's population live on the main island Tongatapu, on which the capital city Nuku'alofa is located. Tongan and English are the two official languages of the Kingdom of Tonga. Most of Tonga’s inhabitants live on the island of Tongatapu. About 98% of Tonga’s population is Christian, with the largest denominations being the Free Wesleyans, The Church of Jesus Christ of Latter-day Saints, the Roman Catholic church, and the Free Church of Tonga. Much of modern Tongan culture is influenced by both Christianity and Polynesian traditions. Businesses and entertainment venues are closed on Sundays by law. Though Western-style jobs have grown more common, some people still make their livelihood from fishing and farming. Women hold a higher social status than men in traditional culture. Rank and status also play a large role in Tongan culture—people are born into their rank, and Tongan culture has a social hierarchy involving chiefs and commoners. The king and high chiefs (or nobles) have the highest rank and status. Fēfē hake? – How are you? Ko e hā ‘a e le‘a faka-Tonga ki he ____? – How do you say ______ in Tongan? Tonga is very much about its people and culture. Tongans are welcoming, relaxed, and generally happy and easygoing. The "no hurry" lifestyle is even evident in the national road speed limit; just 40km (or 25 miles) per hour and strictly enforced! The family is the central unit of Tongan life. Each family member plays a role, with older persons com-manding the most respect. Family members will greet one another with a “sniff-kiss.” This is when a person puts their nose next to someone’s face and breathes in deeply. Body image is very different - in Tongan culture, to be large is beautiful. Women in Tonga have a higher social status than men. The father's oldest sister is accorded the highest level of respect at all formal and informal occasions from funerals to weddings and births. She acts as the family matriarch and oversees her siblings, nieces, and nephews. 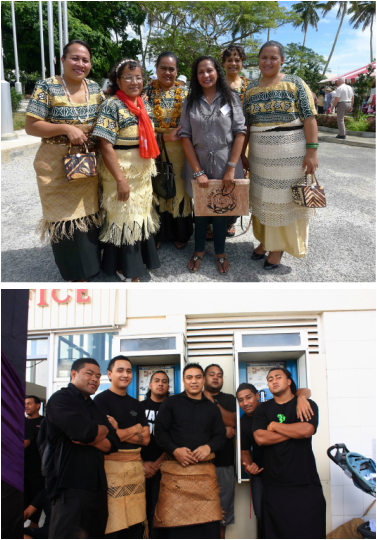 Religion closely follows the family in importance, and almost all Tongans are churchgoers. All commerce and recreation are prohibited on Sundays, the Christian day of rest, and much of Tongan social life is structured around the church. Tongans in rural areas are largely self-sufficient, relying on foods from their gardens and fish caught from the ocean. Floor Area: 21,184 square feet. The Nuku'alofa Tonga Temple occupies a beautiful tract of land several miles south of Nuku’alofa at the site of Church-owned Liahona High School. It was the first temple built in Tonga and the fourth built in Polynesia, following the Laie Hawaii Temple, the Hamilton New Zealand Temple, and the Apia Samoa Temple. The first dedicatory session of the Nuku'alofa Tonga Temple was held in the temple, but the remaining sessions were held in the nearby gymnasium of Church-owned Liahona High School. In order to attend the dedication, many members sold their farm produce, animals, or other belongings. Services were crowded with over 3,000 attending the final service, creating an overflow into other rooms of the building. In June 2006, the temple closed for an extensive expansion and remodeling project. The temple reopened the next year with over 5,000 additional square feet and a beautiful interior.